Forget the Blue Economy of SIDS – Let’s talk about the Economies of Fat! Everyone knows about it but no one wants to discuss it as one of the most important problems of sustainable development and the transition to a Blue Economy. I’m talking about the F word – FAT Continue reading Forget the Blue Economy of SIDS – Let’s talk about the Economies of Fat! Posted on May 14, 2015 January 7, 2016 Categories HealthTags Blue Economy, obesity, SIDSLeave a comment on Forget the Blue Economy of SIDS – Let’s talk about the Economies of Fat! Time to Walk the Talk. By quoting President Michel the United States has finally acknowledged the seriousness of climate change. Obama and Michel joined 120 heads of states and government last week to attend a climate summit entitled “Catalyzing Action” hosted by UN Secretary General Ban Ki-moon. When Ban Ki-moon had invited world leaders to the climate summit on the margins of the United Nations General Assembly, he had envisaged that some other things would happen. The first “happening” was Climate Week in New York where 4000,000 people marched demanding that their leaders take action. Then days later the climate summit happened where our own President’s words were echoed by Obama. In November countries will meet to make pledges to fill up the Green Climate Fund. Then onwards next year to Lima, Peru, where the first draft of the so-called Paris agreement will be sorted out. March 2015 is the deadline for countries to agree on new national targets for cutting climate pollution. Only if this is done can success be grasped at the next conference of the United Nations Framework Convention on Climate Change (UNFCC) in Paris in December 2015. If not it means the end. The End of Seychelles As We Know It? 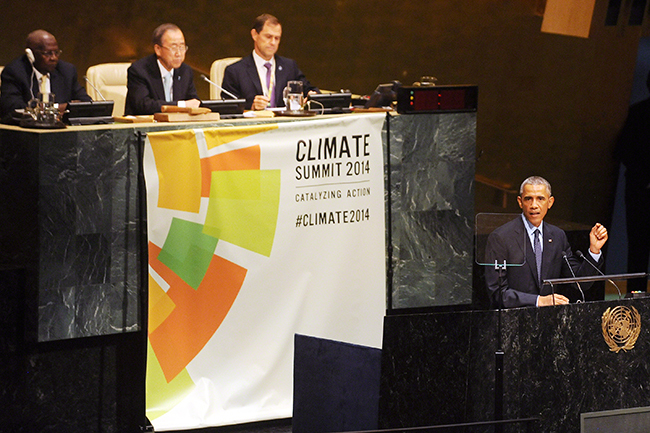 “Climate change – on our current path – is a crime against humanity. We are all guilty. And we are all victims. 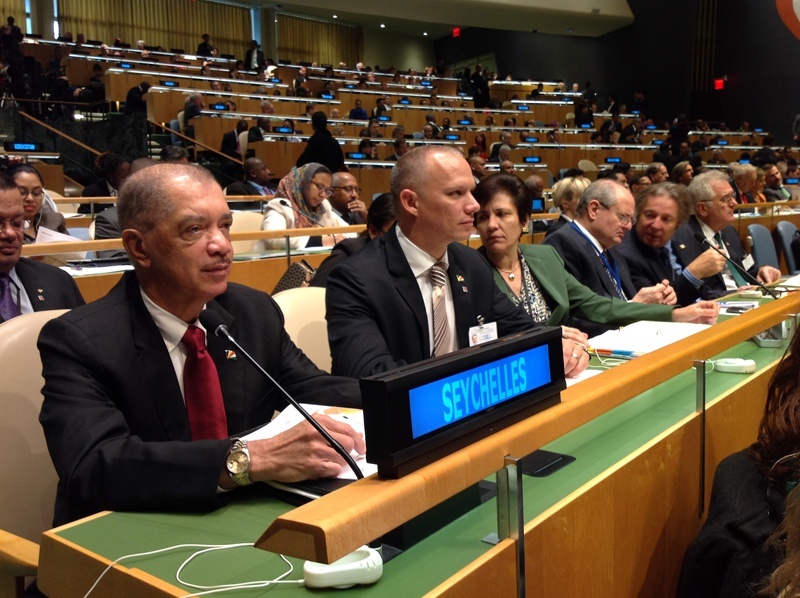 But increasingly, SIDS themselves, are refusing to be victims,” said President Michel in New York. The President went on to describe some of the things that the Seychelles government is doing to adapt to climate change including the debt for adaptation swap to create marine protected areas that build climate resilience while receiving debt reduction. But personally, I see the President’s refusal for Seychelles to become a victim as a huge inspiration for local action by people in our own country. Unfortunately, for too long Seychelles like all SIDS has portrayed itself as a victim of climate change because it didn’t see itself as a contributor to global warming. The danger with this position is that our people have become too blasé about personal responsibility. It’s the same all story all over again: Whoever you talk to in Seychelles about climate change is into denial and says “it’s somebody else’s problem to solve”. It isn’t someone else’s problem! Seychelles has a high per capita use of fossil fuels, more than 3 times that of Mauritius. It’s a dubious distinction that we are in the list of the 50 countries with the highest energy use per capita. Minister Pierre Laporte only this week remarked that 78% of the foreign currency generated by tourism goes to purchase petroleum products. Our lifestyles keep adding emissions and other impacts into the environment. Private car ownership is about 11,000 out of a total of about 17,000 vehicles in the country. This is the highest private car ownership per capita in the region, more than Mauritius and South Africa, actually the highest in Africa. It’s interesting to also note that the total number of persons with driving licenses is less than 10,000. Renewable energy is only now taking off. Electric and hybrid cars seem to be trickling in. The constraint is that the up-front investments into renewable energy are very high. We must somehow get these costs reduced to get more individual action. It is said that Seychelles has the highest per capita ecological footprint in Africa. The idea of the ecological footprint concept is to compare the ecological area available in a country with the ecological area required to support a certain lifestyle, thus offering an instrument to assess if consumption is ecologically sustainable. Because we import so much including food and fuel our per capita carbon footprint is huge and is much larger than our ecological space. It may be wonderful to have so many goods in the shops but most of these come from somewhere else, transported by ships and planes that use fossil fuels and whose emissions contribute to global warming. Professor Stefan Gossling of Sweden and his colleagues published a paper in 2002 in the journal Ecological Economics showing that just to service the tourism market Seychelles has made itself unsustainable in terms of ecological foot-printing. The lesson to be learned is we must consume less from overseas and produce more locally. We must see ourselves as climate champions not climate victims -victims will always feel powerless, angry and frustrated. Nature Seychelles is one local organisation that has championed climate action seriously by going beyond talk. It has restored the wetland at Roche Caiman and proven that it can absorb flood waters effectively and work as a carbon sink. It has made Cousin island the first carbon neutral island in the world. One if it’s most successful projects attracting global attention is the restoration of coral reefs in the face of climate change. Nature Seychelles has now planted 40,000 pieces of corals, all grown in underwater nurseries using internationally accepted methods. The worldwide services of coral reefs have an average annual value estimated at US$172 billion. Coral reef services include the provision of food, raw materials, climate regulation, and moderation of extreme events, waste treatment/water purification, biological control, recreation, tourism and maintenance of genetic diversity. And one quarter of all marine species depend on coral at some time in their lives. The only way to win the climate war is to mobilise everyone. The problem is that most of the funds coming into the country for climate change adaptation go through the Ministry of Environment and Energy. If we want to solve problems then we must have climate democracy as the world saw in New York. Organisations which can take action, and I mean real, effective action not more talk, must be supported to do so. At the SIDS meeting in Samoa I heard Tommy Remengesau the President of Palau say: “The future problems are not going to be solved by governments but by the private sector and civil society”. But our civil service culture in general has been not open to citizen input and collaboration. The need to control blocks creativity, innovation and personal initiative, all necessary components of what President Michel has described as the new frontier. It is a mentality that also refuses to admit that there are people outside government who may have more knowledge and drive than government officials. This has now become the biggest barrier to getting the private sector, NGOs and the rest of civil society united with government in combating climate change. To deal with climate change we must first change ourselves.